Stretched earlobe piercings are commonly called "gauges," which is an incorrect term. The term gauge refers to the measurement, or size, of the earlobe piercing. When a person desires stretched earlobe piercings, the first step is piercing the earlobe. An earlobe can be pierced as small as 18 gauge or as large as 0 gauge. Professional piercers use sterilized needles or dermal punches to perform the procedure. Regardless of the size of the initial piercing, the earlobe piercing must heal completely before stretching to a larger size. A waiting period of a month, or longer depending on the elasticity of the earlobes, is necessary between each stretch to a larger gauge. Place your earlobes under hot, running water for one minute each. Perform this in the shower or under the faucet of a sink. If the earlobes are tight around the jewelry, the hot water helps the elasticity of the earlobes and makes the process of removing the jewelry less painful or traumatic to the ears. Test the water with your hands first to prevent scalding. Wash your hands with a liquid antibacterial soap and warm water. Dry your hands with a paper towel. Turn off the faucet with the paper towel instead of using your hands. Touching the faucet without a barrier--such as a disposable paper towel-- will introduce bacteria back onto the hands. Introduction of bacteria to the earlobes can result in a trapped infection while the ear piercing shrinks or closes. Remove the jewelry from both ears. Wash the jewelry with an antibacterial soap and warm water. Dry the jewelry with a paper towel. Place the jewelry in a plastic bag. Store the jewelry bag in a jewelry box or medicine cabinet for future use, or dispose of it if you are never going to stretch your earlobes back to that size. Wash the ears daily in the shower with soap and water. Avoid touching the earlobes with your hands and prevent contact from other people's hands and saliva. Disinfect phones before and after use. Insert jewelry of the next smaller size after the earrings have been out of the earlobes for a month. For example, if your earlobe piercings are at zero gauge when you remove the jewelry, insert two gauge jewelry after a month. Repeat this process every month until the desired size of jewelry fits in the earlobe. Leave jewelry out completely if closed piercings is the desired outcome. Use soap as a lubricant when inserting new jewelry. Visit a professional piercing shop when purchasing earlobe jewelry to avoid allergic reactions from inappropriate jewelry. Never share jewelry with anyone to avoid bacteria or disease transmission. Never attempt to pierce or stretch your own ears. Maude Coffey retired after 10 years working as a professional body modification artist in the tattoo industry. She is certified in principles of infection control and blood-borne pathogens. Coffey received additional training and classes, such as anatomy, jewelry standards and aftercare, from the Association of Professional Piercers. 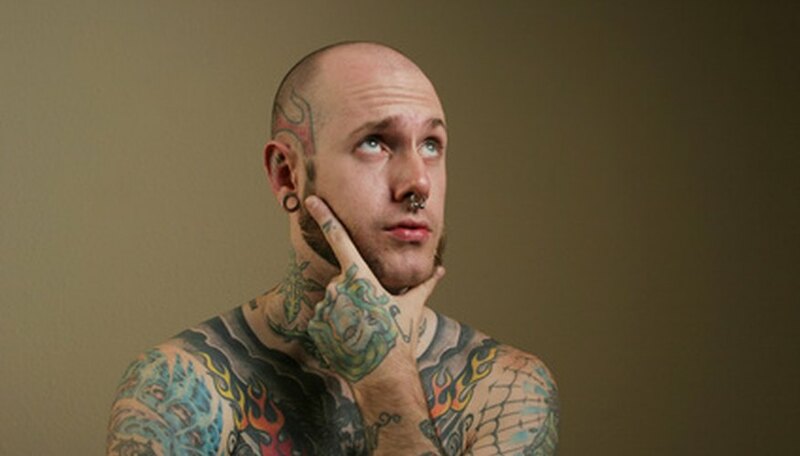 Coffey aims to educate about safe tattooing and piercing practices while writing for various websites.